The aim of the network is to create a safer society in the digital age. A recent news article noted that CyberSecurity Malaysia (CSM), the national cybersecurity specialist and technical agency under the purview of the Ministry of Science, Technology and Innovation (MOSTI) in Malaysia, has signed the Terms of Reference to become the first corporate supporter in Asia to join The Intelligence Network. The Intelligence Network is an industry initiative launched by a British multinational defence, security, and aerospace company in July 2018. It is powered by a global community of like-minded cyber and financial crime professionals and industry influencers committed to creating a safer society in the digital age. The purpose of The Intelligence Network is to understand, explain and tackle the enduring challenges of cyber-security to improve collaboration, simplicity and certainty. The General Manager for International Key Accounts of the British multinational firm stated that The Intelligence Network was borne out of the principle that the size and scale of the societal issues the world, and Asia, is are facing the need to be addressed by the greater community and not by one organisation alone. It was noted that we live in a highly connected world that’s in the midst of significant changes. Cyber attacks are evolving and the worlds need to rethink the model being used to counter the risk. Through the work of The Intelligence Network, the aim is to kickstart conversations about the future of cyber defence. Moreover, CSM joining The Intelligence Network continues the close collaboration between the multinational firm and CSM whilst bringing an ASEAN-specific context to the initiative, enabling truly global collaboration and insights. In addition, the group is working to further deepen and extend its collaboration with the Malaysian agency and look forward to the unique perspective and contribution CSM will bring to the Intelligence Network. The CyberSecurity Malaysia CEO noted that the agency welcomed the opportunity to become a corporate supporter of The Intelligence Network. The agency has made clear that it is committed to making a difference and taking a proactive role in creating a safer society in the digital domain. The CEO noted that if cyber-criminals use creativity and collaboration to perpetrate their malicious intent, from a cyber-defence perspective, the Malaysian Government, and the global community, in general, must be doing the same and promote more openness for information and intelligence sharing. It was noted that collaboration is the key to eliminating the risk of cyber attacks. 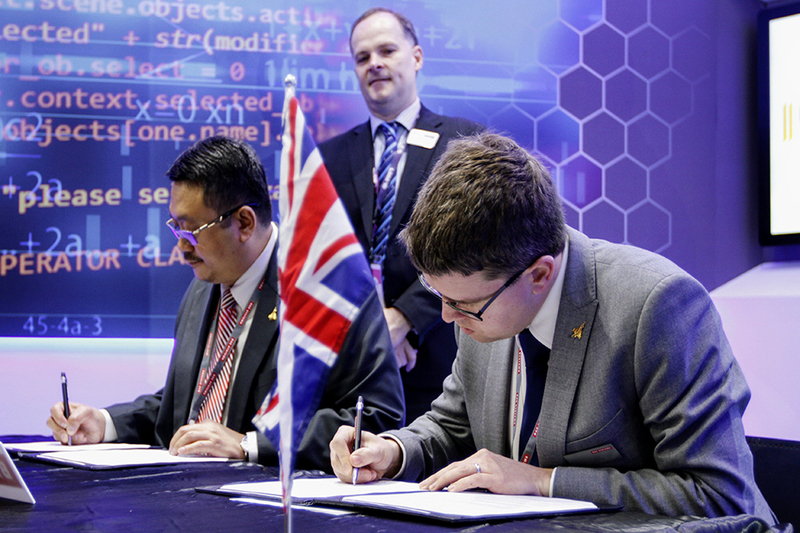 The signing ceremony held in conjunction with LIMA 2019 was also witnessed by the Secretary of Defence and Security from the British High Commission in Malaysia and the country manager for the British multinational firm in Malaysia as it signifies CSM becoming part of a global network of like-minded organisations which include various massive telecommunications and e-commerce firms. It was recently reported that almost every second industrial computer in the world was subjected to malicious cyber activity in 2018. Malicious cyber activities on ICS computers are considered an extremely dangerous threat as they could potentially cause material losses and production downtime in the operation of industrial facilities. In 2018, the share of ICS computers that experienced cyber attacks grew to 47.2% from 44% in 2017, indicating that the threat is rising. While Kaspersky Lab ICS CERT recommended implementing technical measures (like regularly updating operating systems, application software on systems that are part of the enterprise’s industrial network; applying security fixes to PLC, RTU and network equipment used in ICS networks where applicable, etc. ), the truth is that a global initiative, such as The Intelligence Network, is needed to combat the threat of the malicious cyber activity.